Peter and Yulia are excited to be your hosts for the Chicago Harvest Moon Ball Championships; which will be celebrating their 55th year October 11-14, 2018. 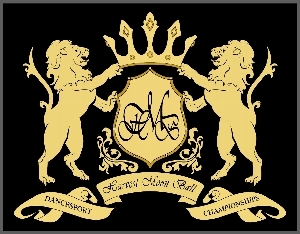 As one of the oldest and longest running ballroom dance competitions in the United States; The Chicago Harvest Moon Ball was a phenomenal success in 2017,with over 5700 entries, showcasing wonderful events like Professional American Smooth Star Dance Tour, "Best Of The Best" Dancesport challenge and World Dancesport series. We look forward to making The Chicago Harvest Moon Ball Championships better and better each year, next year starting earlier on Thursday, to accommodate the increase in entries and to facilitate added dance events. Keep up with us on our website while we continue to update information as it becomes available. Be a Star! Expect to be interviewed, if you are a winner! Attention Collegiate Competitors - We're making history! Use DanceComp Mobile App to enhance your Harvest Moon experience. 2014 US and World Professional American Rhythm Champions Emmanuel Pierre-Antoine & Liana Churilova, join "Clash Of The Dance Titans"
Saturday Night Show at the 2014 Chicago Harvest Moon Ball announced! Hotel Room Block nearly sold out! New Top Student Award Category!